Gemzar was mom's first experience with a chemotherapy drug. And it was a short-lived experience at first. The doctor had planned to use gemzar as the first line treatment. He combined it with another anticancer drug called Tarceva. The plan was to use this chemo combination for a 4 week cycle, take a week off, and then go back on the chemo. Mom was able to stay the course for approximately 2 weeks. And then she ended up in the hospital with a fever of 104 and such highly elevated liver enzymes that we were concerned she was going in to liver failure. Needless to say, they stopped the chemo immediately. Turned out that it wasn't liver failure, and it may not have totally been the gemzar's fault either. She had a blocked or occluded biliary stent. You can read more about the origin of her biliary stent here. The gastroenterologist performed another ERCP to replace the blocked stent with a new stent and mom's liver enzymes made a quick turn around. It seems that a lot of doctors only give out information on a need to know basis. He told us after the surgery, that most biliary and pancreatic duct stents are plastic and have a life span of roughly 3 months. Her symptoms, fever, chills, flu-like misery and elevated liver enzymes, were all typical of an occluded stent. Personally I think that was some need to know information! Thank you very much! But the oncologist disagreed with the surgeon and said the symptoms could also be an adverse reaction to the chemo, as her blood counts (white blood cell, red blood cell and platelets) were all too low as well. He immediately put a halt to the Gemzar treatment. So what do you do? The surgeon said it was the stent. The oncologist said it was the chemo. Hello - you guys are the professionals... Can someone make a decision?! Well, while the doctors debated mom's case, we took a breath, regrouped, and got a second opinion. After regrouping, we put chemo (and our first oncologist) on ice, and headed over for some radiation therapy. Then we went back to the Gemzar, but this time using it alone without the Tarceva. While on the Gemzar we have received quite an education and I'd love to share it with you. GEMZAR - Looks innocent enough. But, boy does it pack a punch. GEMZAR, or gemcitabine, works by stopping the process that cancer cells use to divide and repair themselves, leading to cell death. It is usually given in an IV (runs through a needle into a vein). This infusion or IV takes about 30 minutes. It is given once a week for 3 weeks, and then the 4th week you get to take off to rest, before starting all over again. This is called a 4-week cycle. Some doctors like to use a "loading dose" making the first cycle an 8-week cycle, 7 weeks on and 1 week off. Followed by a series of 4-week cycles. In mom's case, the doctor planned several 4-week cycles back to back. At each weekly dose of Gemzar, he pre-medicated her with 2 IV drugs to help prevent some of the side effects. One of those drugs was called Kytriol, an anti-nausea medication and the other was Decadron, a steriod to prevent an allergic reaction. 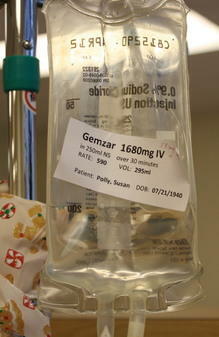 Once these 2 drugs were administered, the Gemzar was added to the IV. It ran for 30 minutes and then was followed up with another 30 minutes slow-drip saline drip. Regular blood tests will be taken before and during your chemotherapy treatment. This will help the doctor monitor your progress and decide if the treatment should be continued, the dose changed or treatment stopped altogether. The doctor also looks at the benefits received from the treatment and the side effects experienced. And those side effects can be vicious. Here's the list of the most commonly experienced side effects. Just remember, most people do not experience all the side effects listed. Thank goodness for small kindnesses. Flu-like Symtoms - You may have headaches, aching joints and muscles and a high temperature. Fatigue - feeling weak and extremely tired. Nausea and Vomiting - This may begin a few hours after the treatment is given and last for up to a day. Loss of appetite - Gemzar may cause eating difficulties and associated weight loss. Rash and/or Itching - It can cause a rash, which may be itchy. You may also notice some swelling of your ankles. Sore mouth and ulcers - Your mouth may become sore, or you may notice small ulcers during this treatment. Taste changes - You may notice that your food tastes different. Normal taste will usually come back after the treatment finishes. Diarrhea and/or Constipation - Both ends of the spectrum. Hair loss - Usually Gemzar causes a thinning of the hair rather than complete hair loss. Lowered resistance to infection - Gemzar can reduce the production of white blood cells by the bone marrow, making you more prone to infection . This effect can begin seven days after treatment has been given, and your resistance to infection usually reaches its lowest point 10-14 days after chemotherapy. The number of your white blood cells will then increase steadily, and will usually have returned to normal levels before your next course of chemotherapy is due. Bruising or bleeding - It can reduce the production of platelets, which help the blood to clot and stop bleeding. This may lead to unexplained bruising or bleeding, such as nosebleeds, bleeding gums, blood spots or rashes on the skin. Anemia - The Gemzar suppresses red blood cell production and causes anemia. This may make you feel tired and breathless. Whew! I'm feeling a little breathless just reading through the list. The good news is that mom only experienced a handful of these side effects: flu-like symptoms, fatigue, loss of appetite and low blood counts. The flu-like symptoms and fatigue kicked in about 24 hours after the first IV treatment dose. The fever was low-grade, with muscle aches and chills. And the fatigue was that bone deep, can't get out of bed kind, where even sleep doesn't help. Both lasted about 3-4 days, then she began to feel a bit better by day 6, only to go in for another treatment on day 7. We called it our roller-coaster week. With the flu-like symptoms and fatigue she pretty much lost her appetite. Food just didn't appeal. And she definitely had some taste changes. Coffee was her biggest regret. She missed her morning cup, but it just didn't taste good. We fiddled with lots of her favorite dishes and drinks, milk-shakes, ensure, soups and snacks, just trying to find ways to get calories into her. We kept trying, but she still lost 10 pounds that first 2 weeks. It was a constant battle, because as she said, food just tasted like cardboard, hard to swallow. Not very appetizing. The one other side effect that she experienced has been the most predictable. Her platelet and white blood cell counts started dropping and 2 weeks into treatment, they usually bottom out. she teeter-totters through the 3rd weekly treatment and then thankfully has a week off to recuperate. Using the Gemzar without the Tarceva sidekick seems to be working. And so far that has been the treatment that has held the cancer in check the best. 3 weeks on, 1 week off. Side-effects are rather minimal considering. Within 48 hours of the chemo, she experiences mild flu-like symptoms, achy muscles, low grade fever, fatigue and some nausea. After a few days, she begins to feel better and by the next treatment she's ready to go again. No hair loss or rashes, yet. Gemzar is the most potent of the pancreatic cancer chemotherapies to date. If it can knock that tumor back, then mom said it's worth some down time. Her mindset with the chemo and side effects is that the worse she's feeling, the better the chemo is working. She prefers to think that if she's feeling so crappy, then the cancer cells must be having a really bad day.